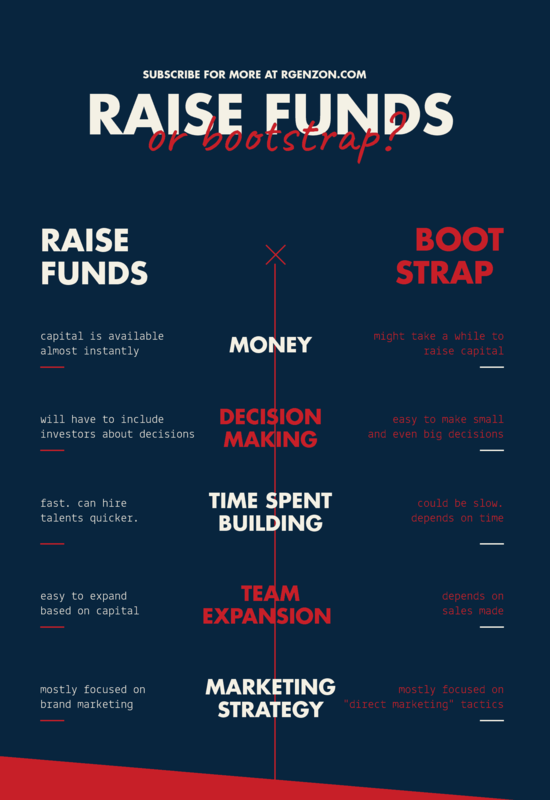 Raising Funds vs. Bootstrapping: Which Works Best? Should You Raise Funds or Bootstrap? If you’re an entrepreneur, chances are, you’re looking at either raising funds or investing your own money. Entrepreneurship sounds cool and all, and I admit, it’s been a fun experience, but let’s be realistic: at one point, this is one of those things that you just can’t avoid having a discussion between you and yourself, heck even with your wife or your partner. With that said, I’ve created an infographic that might help you decide. Is it really important to think about this? I strongly believe that this is just as important as any other elements of your business you’d want to focus on. After all, bootstrapping isn’t easy at all. But at the same time, if you want total control of your own business, then you’d want to invest your own money instead of finding investors. I’m not saying that having an investor is not a good thing. I think it is, but I just strongly prefer to have more control towards my own business than handing over the major decisions that I’d like to be part of (deciding on this matter). Anyways, what do you think?